Your life is more important than your tire. Make sure to pull over to a safe space out of the way of oncoming traffic before you replace your flat tire. What’s the safest way to change a tire when you have a flat? Have someone else do it! If you have Emergency Roadside Assistance, now is the time to use it. You might have a Roadside Assistance service without knowing so. Call your insurance company or check your policy. Some insurance companies include free Roadside Assistance in their policies. Did you purchase your car new? Some automobile manufacturers give you Emergency Assistance when you buy the car. Check your vehicle policy and sale documents. No Roadside Assistance? It’s time to remove the tire lugs. Make sure your car is in “park”. If you have manual transmission, make sure it is in gear. Block your other tires with a rock, etc., to keep the car from rolling. Use your tire iron to loosen the wheel lugs, but don’t remove them yet. When the lugs are stuck, and you need to break them free, you can elongate the tire iron with a length of metal pipe around its handle to significantly increase its torque. Turn the lugs counter-clockwise to loosen them. Be careful of hot asphalt, as your jack can push down into it when carrying the weight of your car. You can spread out and diffuse that weight by placing a strong wooden board under the jack. 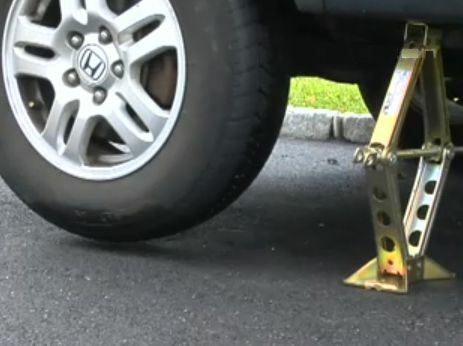 Attach the jack to the specific pre-selected spots on the frame of your vehicle. You can find those spots in your Owner’s Manuel. Sometimes, the diagram is also pasted in the interior of your trunk or even on the jack itself. Jack up the car. Make sure it is high enough to put on the spare, which will be taller than the flat tire because it is full of air. Remove the wheel. You may have to gently kick the tire on the left and right sides of the sidewall to loosen the wheel if it is stuck. Be very careful not to knock the car off the jack. Clean the hub to allow the new wheel to seat correctly. Hold the wheel up and line up the holes with the wheel studs. Your spare can be rather heavy, so be careful. Push the wheel onto the studs, and screw on the lugs lightly with your fingers. Tighten the hubs as best you can with your hands. Use the tire iron to tighten them more, but not to the ultimate tightness. Check to assure that the wheel is seated correctly against the wheel hub. Lower the car to the ground for the final tightening. The weight of the car on the tires will keep them from turning when you apply more pressure. Your wheel lugs have a specific torque rating. Since most people do not carry a torque wrench in the trunk of their car, it is general practice to tighten the lugs as much as you can. Check the air in your new tire as soon as possible, and find a professional tire expert to repair your flat tire or advise you on a proper replacement tire. If your spare is a small “donut” tire, it probably has a maximum speed of 50 mph. Check the speed details on the side of the tire.